Generations of family memories create a rich tapestry woven with many colorful threads, stories about good folks, each with hopes and dreams, who worked incredibly hard to make this land their home. Our family’s Kanwaka heritage originated when a small civil war erupted in violence across the border of Kansas and Missouri with the passage of the Kansas-Nebraska Act of 1854. Ezekiel and Mary Colman were staunch abolitionists who supported the “Free-Staters”—those opposed to slavery. They uprooted their large family from Massachusetts and traveled with the Fourth Emigrant Aid Party to help Kansas enter the Union as a free state. In 1858, the Colman family chose this property located in the Kanwaka Township where they built a large home and planted food. Just north of this property, the Oregon Trail ran parallel to California Road (now Highway 40). The rutted tracks carried thousands of westward-ho, California-bound pioneers. Great quantities of food had to be produced, not only to feed Ezekiel and Mary Colman’s many children, but weary travelers in search of provisions, shelter, and fresh drinking water available from the former Yankee’s water tank—a large, underground, cement cistern next to the southeast corner of the house. And, there were many settlers who were lured to the Kansas Territory by the promise of free land, but woefully unprepared for and unfamiliar with Kansas’ unpredictable and harsh climate. Freezing cold and hungry, many were sent to Colman’s Inn for housing. This place was also called Colman Retreat. The upstairs bedrooms were divided into tiny sleeping quarters by sheets hung across ropes to provide a bit of privacy. The Colman, Richardson, and Hird families intersected in 1875 with the marriage of Osgood Andrus Colman, the son of Ezekiel and Mary, to Flora Richardson, daughter of Phebe and Asa Richardson. Her brother was my Great-grandpa Herman Richardson. Their father was my Great-great grandpa, Asa Richardson, a descendant of the Massachusetts Puritans. In 1870, Asa and his wife, Phebe Watson Richardson, moved their 11 children from Monroe, Wisconsin to the Kanwaka Township. As fate would have it, they built a great house just on the north side of California Road (as a crow flies) about one half-mile north of the Colman family’s house. 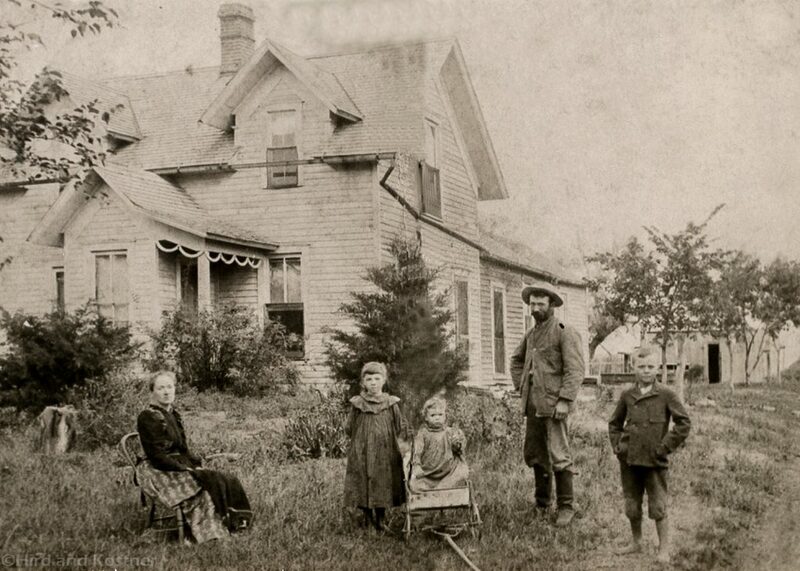 After their marriage, Osgood and Flora lived on the farm “next-door”, adjoining the southeast corner of the Colman family house a half-mile or so—as those flying crows would indicate. In 1894, my paternal Great-grandfather, Herman Orange Richardson, purchased this property from Olla Colman Bigsby, Ezekiel and Mary’s daughter. Married in 1884, Herman and his wife, Ina Kate Pontius, bore four children, including my grandmother, Ethel Callie. Their only family portrait looks northeast from the southwest corner of the former bed and breakfast. This picture was taken in 1894. 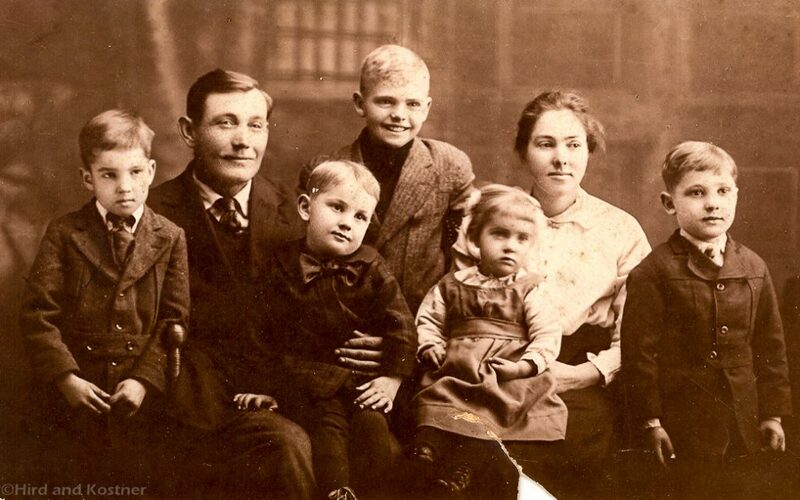 Great-grandfather Herman Orange Richardson, his wife, Ina Kate (who passed away only 4 years after this was taken), Ethel “Callie” (my grandmother) with her siblings, Mabel and Arthur. At that time, Herman purchased the property from Olla Colman Bigsby. Forty-five years earlier, this house, with it’s historic location as part of the Underground Railroad, was known as the Colman Retreat, Colman Inn, and also referred to as the Old Colman Hotel. 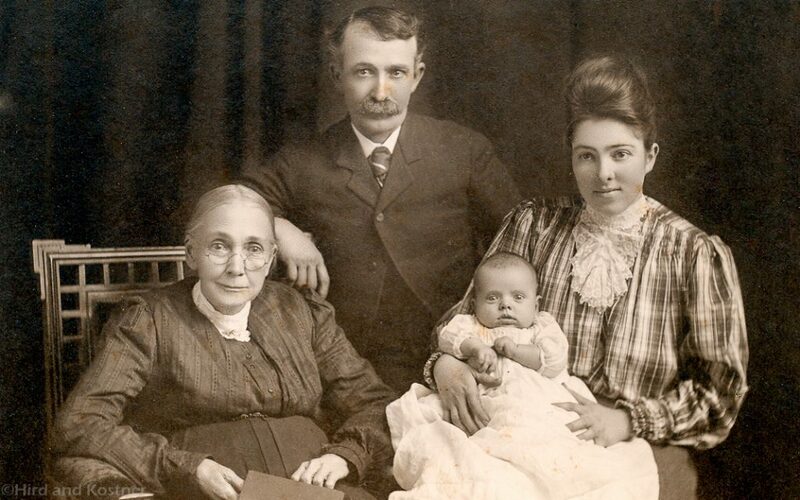 Great-great Grandmother Phebe Richardson, her son Herman Orange, his daughter, Ethel Callie holding her first-born son, Harold. Phebe and Asa Richardson lived in the Kanwaka township, along the California Road and the Oregon Trail, just one-half mile north from Herman’s house. Phebe and her daughters helped Herman raise his four children after the death of Ina Kate at age 33. Ethel Callie married Arthur Hird in 1909, and they raised eight children on this property, living in the same house where Callie grew up. 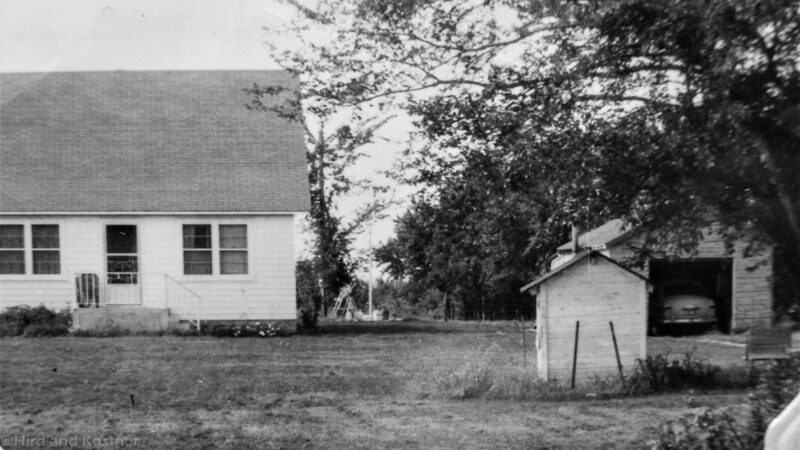 In the mid-1920’s, their family moved to Baldwin. 1917 family portrait of Arthur Hird and Ethel Callie Richardson Hird, L to R: Ivan, Arthur, Lyall, Harold, Marguerite, Ethel, Eugene, was taken during the time they lived on our family property in the Kanwaka Township. Born after this portrait were siblings Vera, Robert, and Helen. This photograph was taken around 1946. Otis Eugene Hird stands in front of the old house, originally built in 1860 and demolished in 1955. On the far left of the picture, near the water pump, are the large Lilac bushes first planted by Ezekiel and Mary Colman that remain blooming to this day. On the hill in the background stands the one-room, Kanwaka Grade School where Flora Richardson Colman once taught eight grades. While I was the last Hird to graduate, four generations of Richardson and Hird children graduated from this one room, eight-grade, Kanwaka School before the consolidation of rural school districts in 1962. 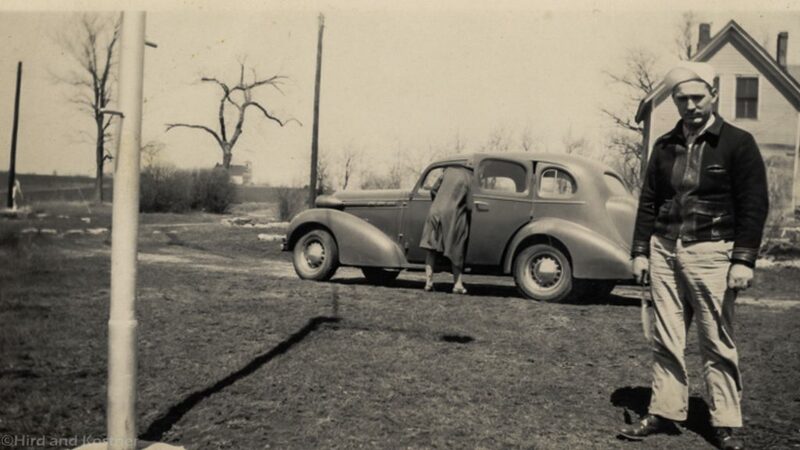 In 1940, when he was 28 years old, my father, “Gene” Otis Eugene Hird, purchased the land from his Grandfather Herman. Two years later, Gene married Dorothy Tasker. Together, they built a new house to raise their family. “It’s a good place to live,” my father always declared. Eugene and Dorothy Hird built all of the structures on this property. The playhouse was built by Dorothy from lumber scraps. This picture was taken around 1956. Six generations later, my brother and I are the fourth generation owners from the Richardson and Hird family to hold precious this heirloom property. With this rich family heritage, it is important to be mindful that we are caregivers of an organic, food-producing property. 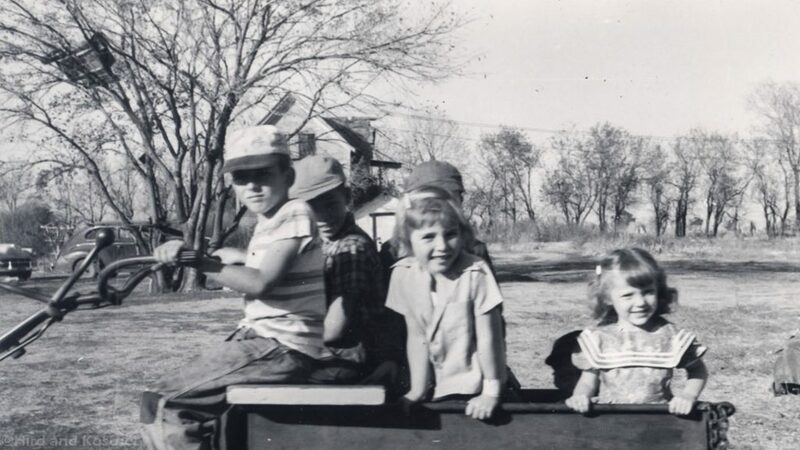 This 1953 picture is of the second generation of Hird children playing with friends. In the background, are the structural remnants of the Colman Retreat or Old Colman Hotel. The original home was built in 1860; this structure was modified after damage from several storms. Along the North side is a double row of hedge trees that remains to this day. These venerable old trees were originally planted by Ezekiel Colman to provide a visible road to the Colman Retreat for passing travelers who sought shelter and provisions. 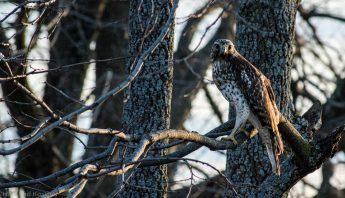 From prey to predator, this land has nurtured an abundance of flora and fauna, each so crucial to the good order of all living things in this area. Growing up, I spent many family meals at our kitchen table, enthralled as various wildlife meandered across this field on a near daily basis, heading west at breakfast, and east at supper. It is a timeless animal highway that connects across miles of neatly packaged properties. 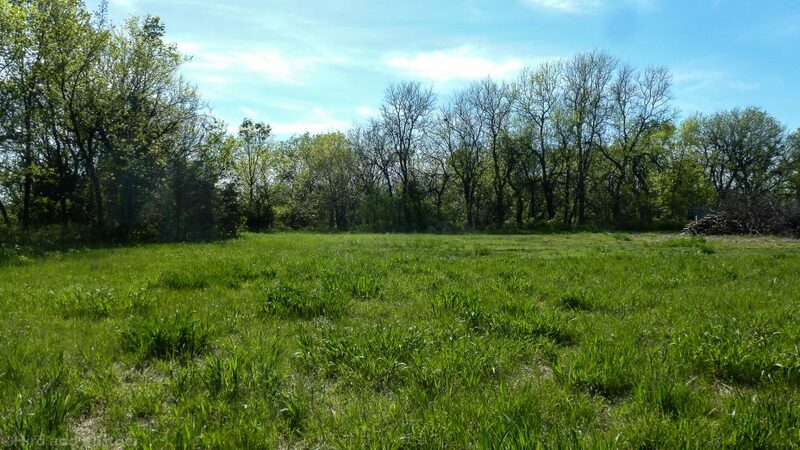 This was once a wide-open area, but the years have divided the land with forested fences and legally-binding documents. Such boundaries have no meaning to wildlife who lose their precious heritage with encroaching development, chemical farming, and deforestation of habitat. Like clockwork, at sunrise and sunset, local wildlife cross this field, one group after another. As small children, my older brother and I created our own paths across this property. We found many treasures from those days gone by when this property was filled with fruit trees and produce to feed large numbers of people. My brother and I would find harbingers of the past, popping into our mouths heavenly sweet red strawberries— the last remaining plants of the old, thriving berry patch. Or, we would discover a small cluster of deep purple grapes, hanging from the sagging fence that held the grape arbor, once heavily laden with vines and fruit. Sometimes, the gnarled peach trees produced big, juicy peaches which we ate right off the tree. If there were enough apples, my mother made a two-crusted fruit pie. With the leftover crust, she made us pastry crullers sprinkled with sugared cinnamon! Our heartfelt desire is to be good stewards of the land without resorting to the use of harmful chemicals or destroying habitat. 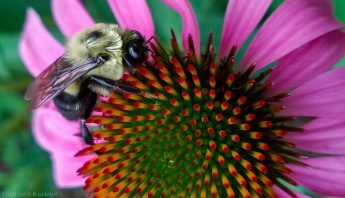 Now emerging from the ground, hundreds of native host and nectar plants can feed many species of pollinators. These insects are required to pollinate the plants that feed small mammals that, in turn, feed other wildlife. The forest canopy, high above the forest floor, is filled with old growth trees. These areas thrive with wildlife. Wherever possible, create space to plant native host and nectar flowers. 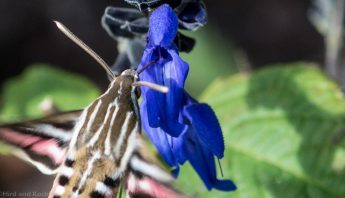 This is an ambitious project to restore native host and nectar plants to our little neck of the woods, and perhaps, to feed us, too. 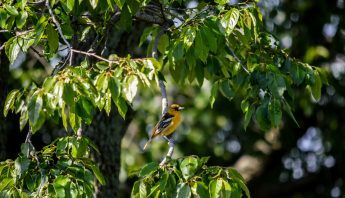 As the city limits move closer, the need to act responsibly and respectfully towards the land becomes increasingly desperate as nearby farms are bulldozed, cleared of all vegetation and trees, displacing precious habitat. 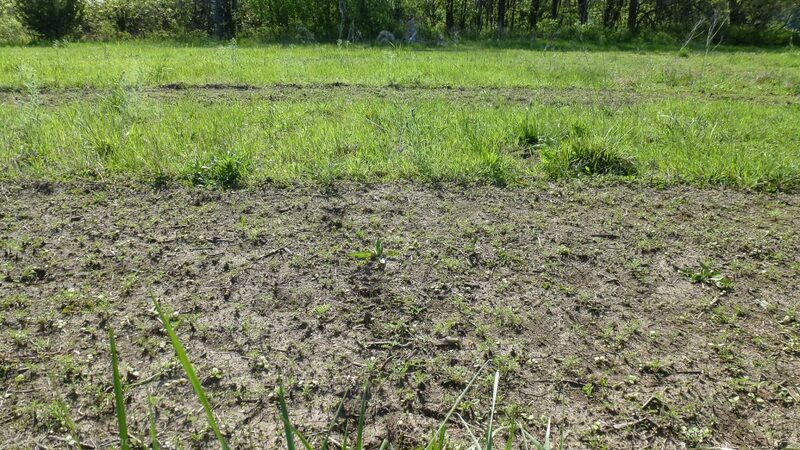 Worse, those leveled fields are then sprayed with lethal herbicides to kill the “weeds” so crucial in the food chain of all flora and fauna, particularly the pollinators. Some 150 years have passed since the early days of settlers and those hardy, California-bound pioneers that jostled heavily-laden wagons along the deeply rutted path of the Oregon Trail. Until WWII, prior to the 1940’s, conventional farming was truly organic. Chemical applications did not exist. With the armistice, great stockpiles of chemical warfare needed disposal. 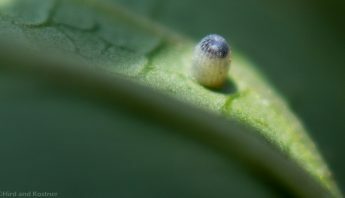 Scientists discovered these chemicals killed certain plants, like all those dratted “weeds” that interfere with farming. 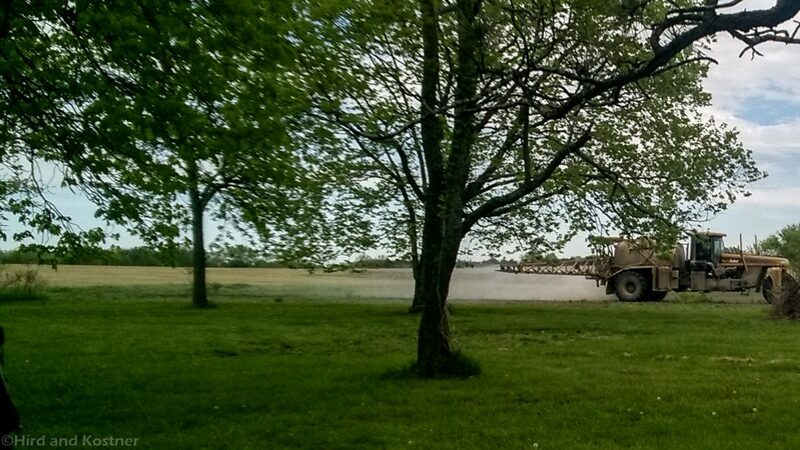 Somewhere along the way, the term conventional came to mean better farming through chemicals. No one had the foresight to think about what all this “better farming through chemistry” would do to the pollinators and wildlife. 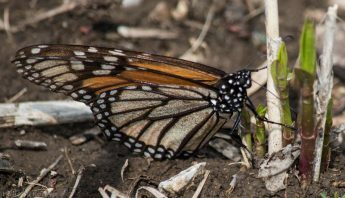 This does not bode well for these food-producing pollinators, or to the world water supply, or to the food produced from this soil, and to our bodies. 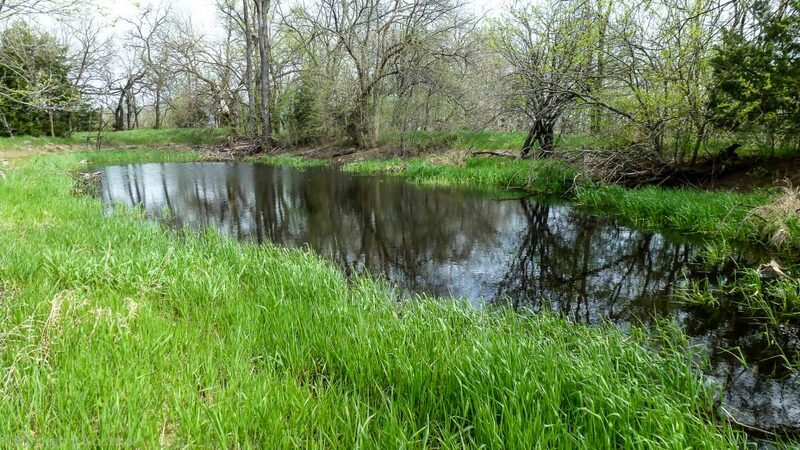 In the creek below this field, we used to hear a robust symphony of frogs that could keep an entire household awake on a warm summer’s night, now reduced to their faint croaking, songs carried across easterly winds.. When the rainy days arrive, animal tracks in the soil tell many stories: their direction of travel, how many are in the group. A pile of turkey feathers might indicate certain meal choices—some are predators, some are prey. The cloven hooves of White-tailed deer walk the same path, one-by-one, where they bed down in the safe haven of the Red Cedar trees that grow thick along property line. Across the generations, where development has not encroached, wildlife follow the same paths through field and forest. Deer follow the same path across this field to hide in the safety of the thicket of Red Cedars along the fence. 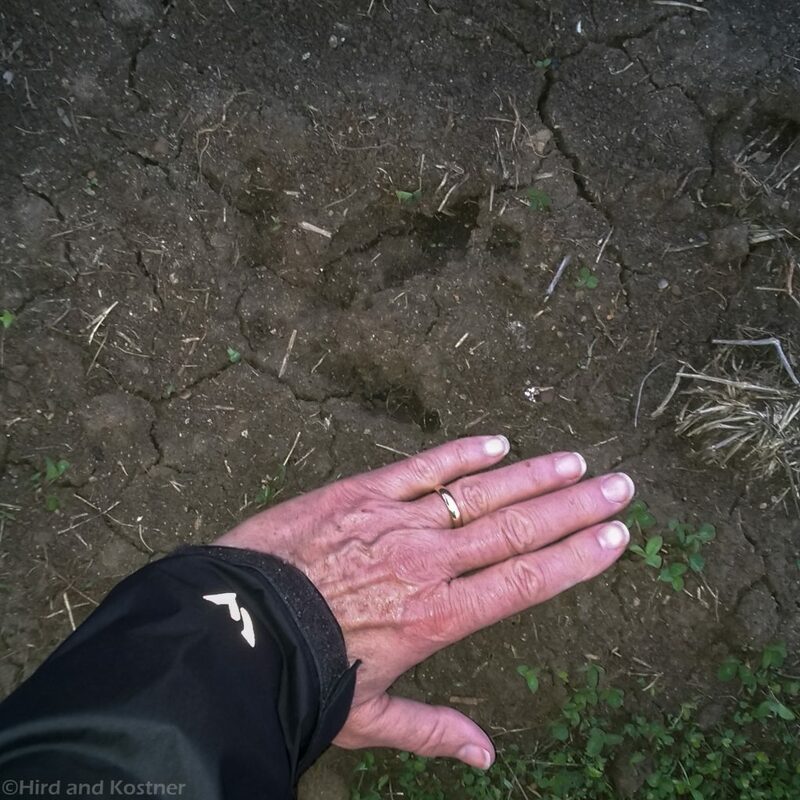 Crossing the field near the cloven hoof prints are hand-sized, three-pointed tracks, neatly pressed into the soil by fast moving wild Turkeys, their feet covered in thick, scaly skin whose pattern is distinctly etched into the dirt like reptilian throwbacks. With feet big as a human hand, these tracks were left by a wild turkey, part of the large flock seen roaming the fields. Groups of wild turkeys are referred to as a rafter. Along the path, when the soil conditions are just right, the hump-backed turkeys stop to roll in soft, dry dirt for a dust bath to clean their long, striped feathers. The soft, tilled soil makes a dust bath for wild turkeys. And with each day, the red fox goes “mouse-diving” in the field. This fox hunts in the field, following a east-west path that connects several properties. Across a distance of one mile, at either end of this particular hunting path, are two, very well-built, chicken-coops, each one filled with mighty fine and plump, laying hens. 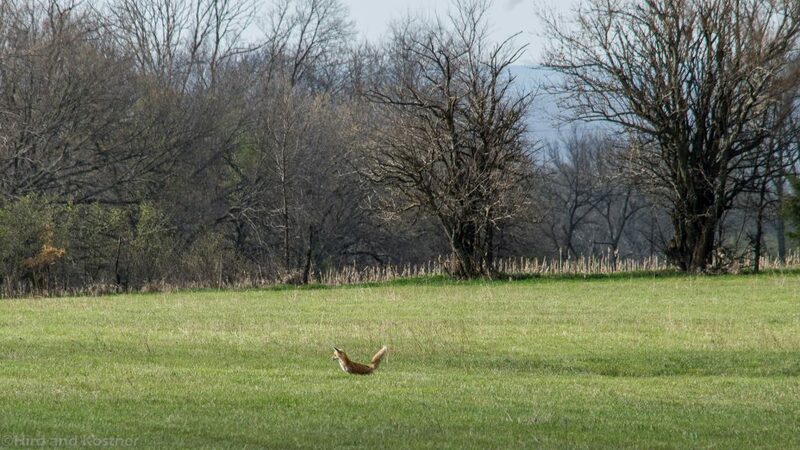 Mouse-diving in the field, the Red Fox follows a daily route to check on the availability of any plump laying hens. Along the way, she finds field mice or rabbits. The neighboring chicken houses are much more secure—now. Our local coyote family hunts rodents and small mammals. From time to time, these meals include family pets. During drought, or when food is scarce, coyotes also hunt deer and cattle. 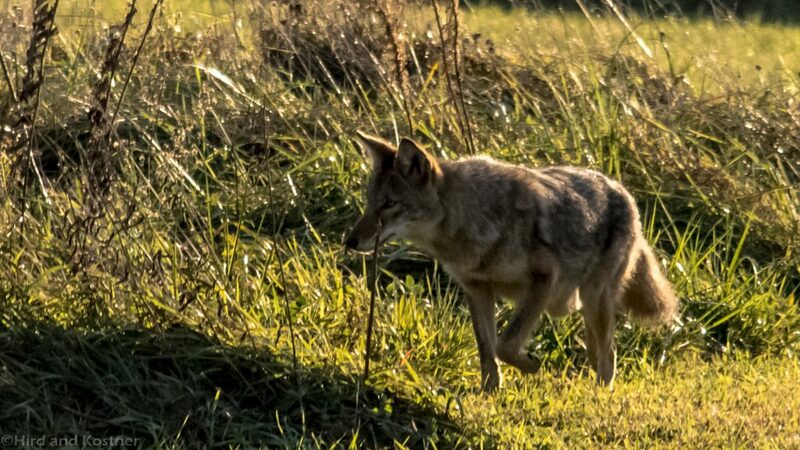 This particular coyote follows the deer trail looking for rodents. And, like the sly Red Fox, our Wily Coyote hunts for rodents along the way. These magnificent creatures are a good reminder to not use rat poison around buildings. 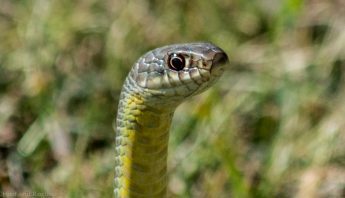 Poison will kill whatever eats the rodent whether it is reptile, raptor, or a four-legged critter. Once hunted by the thousands, healthy coyotes inhabit our forests. They help keep wildlife in balance as they hunt small mammals and occasional deer. 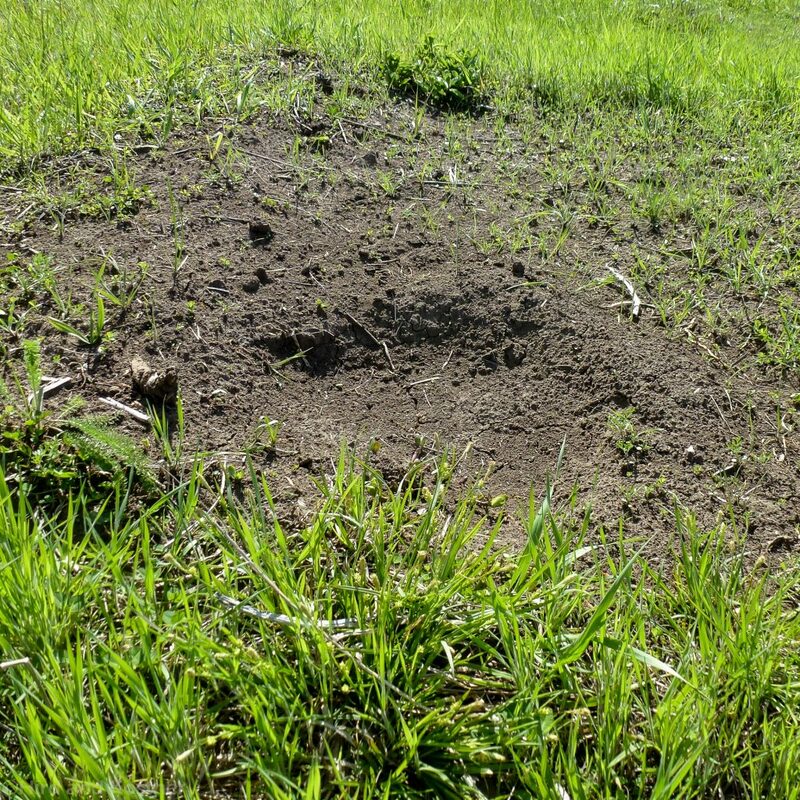 Occasionally, we find the distinct paw prints of our Bobcat. And once, we saw tracks of a cougar passing through the area—that’ll give any one pause to remain observant around wooded areas, looking for a tell-tale, tawny body with long tail! All of these tracks tell the greater story of the entire local food chain and how every living creature relates to another as part of a greater plan. 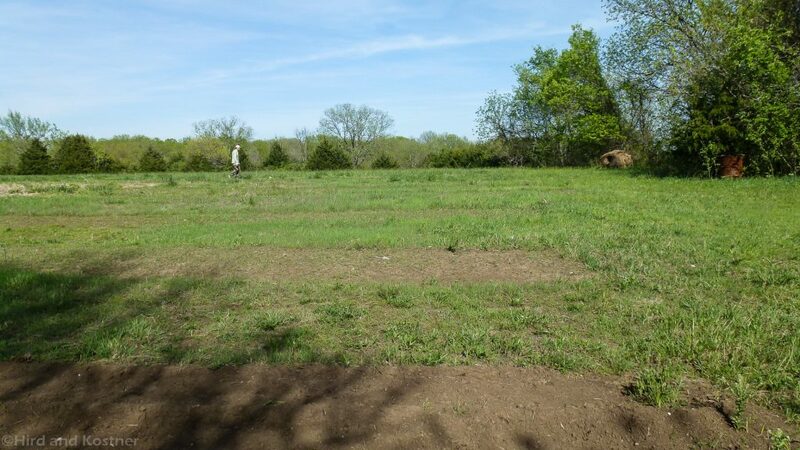 Watching the soil for evidence of local wildlife is almost as much fun as watching the plants grow; such observation develops a greater appreciation and understanding of the plant connection to all living creatures along these animal highways. 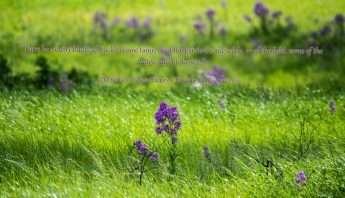 Once the seeds are into the ground and as each seedling emerges from the soil to unfold the first leaves, also emerging is a passionate desire to fiercely guard each new plant. Fencing is not a current option for this garden. 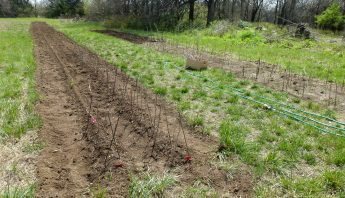 With our abundance of local wildlife, it does not take very long before there are nibbles in the tender seedlings of snow peas, fava beans, broccoli, spinach, collard greens, chard, kale, cauliflower, cucumber, zucchini, and various cabbages. It is impossible to work our fingers into this soil and not think of our ancestors with powerful teams of beasts laboring to pull deep-cutting ploughs across the fields. Most animals don’t like pointy things. While cleaning up the flower beds this spring, it seemed like such a waste to toss into the compost pile what are hundreds of hard, thick stems from last year’s Coneflower and Tatarian Asters. 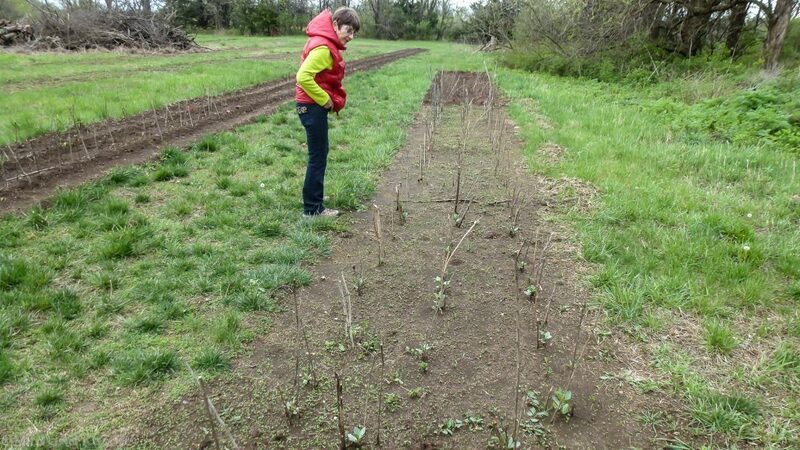 Brilliant stroke of genius said, “Wouldn’t these make perfect plant stakes?” So far, these stakes, placed in an X over each seedling, are a good deterrent to critter plant stomping or chomping. There is a satisfying delight to witness the miracle of seeds emerging from the ground. 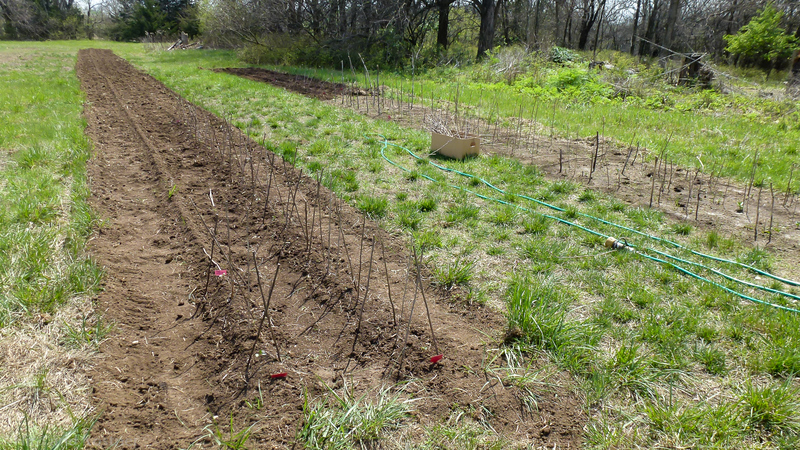 Shown here are purple fava beans, snow peas, broccoli, and cabbage. Many of my ancestors have been here, done that, too! After a bone-dry winter in our neck ‘o the woods, abundant spring rains have replenished winter’s parched soil and filled the pond. The frogs have resumed their yearly chorus. The Great Blue Heron hunts in the tall grass at water’s edge before flying to the nearby neighbor’s over-flowing pond with fish. With water in the ponds, local wildlife can continue their daily trek for food, water, and rest. 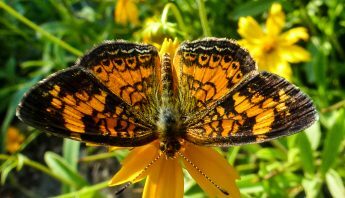 Each year, our local pollinators receive more host and nectar plants as the plants grow, reproduce, and reseed in a chemical-free environment. As my father would say, “All is copacetic” on our Hird Family Property. The joyful chorus of nature’s Ode to Joy croaks once more. Completely dry over the winter, the water in the pond offers precious water for pollinators and wildlife to drink. Over the past few years, a recurring feeling has germinated like a tiny seed planted in the soil. There is a window in my mind, long shut from years of youthful opinion and self-absorption that has gradually opened to present a larger view. It is hard to grasp this wisp of insight. It is but a mere glimpse of what was, what is, and what will come. An organic understanding has evolved through years of performing daily tasks to nurture and care for our family property. Such simple actions, filled with a heartfelt desire to honor and appreciate the legacy of our parents, now envelops all those who have walked this soil. From the displaced Native Americans, to the pioneering abolitionists, and to my grandparents and parents, one thing is for certain: many feet have walked this land, their fingers touched this soil. Following in their footsteps has instilled appreciation for the loving labor of each family to provide a safe home. It has grown a strong desire to know more about our family heritage. 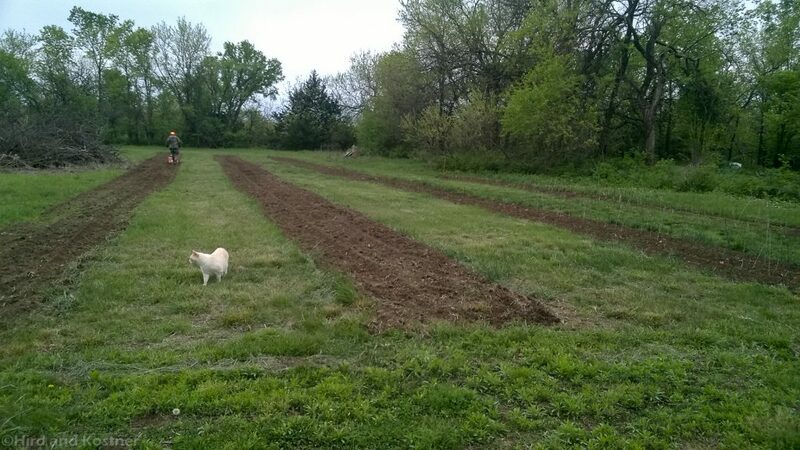 Each time my fingers touch this precious soil, my heart fills with joy and gratitude for their gift of this heirloom property, now resting in the hands of the Fourth Generation.